Burn semantic Web, Burn! | O'Really? This is a work of fiction, though as they say in Hollywood it is “based on a true story”. Characters names are real. A crusade of semantic web believers, is started by three people called Jim Hendler, Ora Lassila and Tim Berners-Lee. At the heart of their faith is a holy scripture and a suite of sacred technology called the semantic web stack. If people use this technology, the crusaders believe, the Web would be a better place. Search engines like Google, for example, would be even smarter than they already are, because they would intelligently “know what you mean“, when you type your keywords. All this new magic comes from using good old fashioned logic, metadata and reasoning. Better Search Engines is one of the mantras of the semantic web troops as they pour onto the battlefield towards the promised land. Viva la Webolution! Charge! A counter-attack is launched by the non-believers of this vision of the future. They rally behind a man called Clay Shirky who roars “the semantic web is doomed” at the top of his voice. Many others echo Shirky’s sentiment, including Peter Norvig, Rob McCool, Cory Doctorow and Tim O’Reilly. General Shirky makes powerful allies in battle, and he has a two-pronged attack. “Ontology is over-rated” he jeers. Led by Shirky, the non-believers capture the sacred technology, add their own firewood and put the torch to it in a very public place. The flames leap into the sky, visible for miles around. “Burn semantic web, burn!” the non-believers cry as they gleefully dance around the fire. The battle rages, the believers will not take this heresy lying down. They regroup and surge forward again. Death to the blasphemers! With the help of some biologists, they seek revenge using the Gene Ontology as deadly ammunition. The non-believers are confused by this tactic, they don’t know what genes are and neither do the biologists. Unfortunately, the biologists unwittingly find themselves in the middle of an epic battle they didn’t start. There are ugly skirmishes involving logic and graph theory. Dormant and hideous A.I. monsters are resurrected from their caves, where they spent the A.I. winter. These gruesome monsters make the Balrog beast from Lord of the Rings look like a childrens cuddly toy. From the relative safety of their command centres, the leaders orchestrating the war look on. Many foot soldiers and PhD students have been slayed on the field of battle, tragic young victims of the holy war. Understandably the crusaders are unhappy. Jim Hendler isn’t pleased as he surveys the carnage and devasation. Ora Lassila is also disappointed. There is a lull in battle. But confusion reigns, especially among the innocent civilians and bewildered biologists. As of the winter of 2007, the semantic web fire is still burning. While I warm myself next to it, using all the juicy metadata as material for my PhD, it is still too early to predict just how useful the technology is going to be. It doesn’t really matter if you’re a “believer”, a “non-believer” or completely agnostic about the semantic web. The religious war beween the two sides tells you more about human behaviour, than it does about the utility of the technology. Optimists profit from making bold claims to get noticed on the battlefield. Critics are more cynical, furthering their own careers by countering the optimists claims. Other people interpret the interpretations of the cynics second-hand. Thanks to cumulative error, or the Chinese whispers effect, everyone gets really upset. The original optimists vision has been changed in ways they didn’t expect. It’s a very natural and human story amidst all the “artificial” machine intelligence. Being internationally known and talked about, but misunderstood by large groups of people? Being relatively unknown, ignored but well understood by a small and obscure group of people? Neither is ideal but I think in most cases, there is only one thing in the world worse than being talked about, and that is not being talked about. We have reached the end of chapter 1 of this little story. Wouldn’t it be nice if Chapter 2 was less bloody? Perhaps the two sides could focus more on facts and evidence, rather than the beliefs, opinions, marketing, hype and “visions” that have dominated the battle so far. As the winter solstice approaches and the new year beckons, can we give peace, diplomacy and above all SCIENCE a chance? The moral of this old war story is simple. Religions of various kinds have been known to make people commit horrendous and completely unreasonable war crimes. Nobody is innocent. 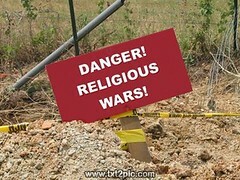 So if you don’t like a fight, steer well clear of religious wars. This quite a story. I haven’t clicked all links and I’m new to your blog, but for all I’m a pacifist. So I sure wouldn’t like to get mixed. I read that you are a biologist. I’m a system engineer inquiring in search technology, but I was bored with logic and math and started to compare human search (in real life) with searching using computers. Therefore I studied neurology and pragmatic linguistics. I’m publishing a series about my inquiry sofar and was wondering if you might have look at it as a biologist. Evolution is one of the qualities i think is needed. You can find the first posts at http://cntxt.wordpress.com/2009/03/20/contextual-information-search/ and http://cntxt.wordpress.com/2009/03/20/googles-one-way-mirror/ BTW about the semantic web, I would prefer to connect namespace, linkspace and contentspace. If it’s gone happen, well a system engineer is not asking about that. He just wants to make it happen.